In city after city, transit agencies are rediscovering that good bicycle and pedestrian access is a critical component of the success of the transit system. It has been estimated that 53 percent of the American public lives within 3.2 km (2 mi) of a public transit route. Walking is the most environmentally friendly and low–cost way to get people to and from public transportation. When given sidewalks or traffic–calmed streets to walk along, safe and convenient ways to cross streets, and a comfortable and attractive environment, most people are willing to walk farther to reach public transportation. In the United States, however, lack of attention to pedestrian needs beyond the bounds of the transit station seems fairly common. The locations of park–and–ride lots are often not amenable to nonmotorized access. One transit agency commented that all of their park–and–ride lots are located near freeways and/or shopping areas where residential housing is quite far away, and no paths or sidewalks are located near the park–and–ride lots. Some U.S. transit and transportation agencies are, nevertheless, turning a promisingly sharper focus on the larger environment that surrounds and leads to transit stations and bus stops. A variety of facilities and services are being provided to improve the interface between bicycling and transit: bike racks on buses; provisions for the transport of bicycles on light– and heavy–rail transit, commuter rail, and long–distance trains; bike parking at transit stations; design improvements at transit stations (curb cuts, signing, and lighting); links to transit centers (bike lanes, multiuse trails, and widened roadway shoulders); and multipurpose Bikestations® which cater to the bicycle commuter. The U.S. Congress has emphasized the connection of transit with bicycle and pedestrian facilities in Federal transportation legislation by providing several funding sources for bicycle and pedestrian improvements through the FTP, among other programs. This lesson discusses the history of bicycle and pedestrian access to transit in the United States and provides an overview of how bicycling and walking are being integrated with transit. Case studies from the United States and Europe describe successful projects. 18.6 Example Transit Access Programs. 18.7 Bicycle Parking Facilities at Transit Stations. 18.11 References and Additional Resources. While U.S. transit authorities have expended considerable planning and engineering efforts to meet pedestrian needs in the interiors of transit stations, in many cases, little attention has been devoted to either the pedestrian or bicycling environment to and from stations. Poorly developed interjurisdictional and interagency cooperation often impedes consideration of the door–to–door experience of using public transportation. It is not unusual for several different agencies to maintain independent control over the various facilities that are used by someone walking or bicycling to and from a single transit stop. Unless these agencies agree to cooperate together in assessing, planning, and enhancing nonmotorized transit access, major impediments to pedestrian and bicycle access may persist or grow in severity. Local and State governments with the authority to manage, maintain, and construct pedestrian and bicycle facilities and roads should cooperate with transit agencies and interested citizens in developing action programs to reduce barriers to bicycle and pedestrian access to transit. Bike–on–transit service enables bicyclists to travel greater distances and overcome topographical barriers. Bike–on–transit services to recreational destinations during off–peak periods can increase overall transit ridership and increase efficient use of capacity. Bicycle–to–transit services (trails, on–road bike lanes, and bike parking) enlarge transit’s catchment area by making it accessible to travelers who are beyond walking distances from transit stations. Bike–on–bus programs are functionally similar to bike–on–rail programs, but often operate in much lower density corridors than rail transport. By expanding a bus line’s access and egress service area, bike–on–bus programs can attract many passengers who would not otherwise be able to use transit for their trip, particularly to reach suburban destinations where transit coverage is often sparse. There are two means of accommodating bicycles on buses—placing them on front–mounted racks and allowing them inside the bus. Rear–mounted racks were the earliest system, but for operational and safety reasons, preferences have shifted toward front–mounted racks (see figure 18–1). Figure 18–1. Photo. The preferred style of bike rack mounts to the front of the bus. Safety and Protection of Transit Property. The study has also shown that the impact of bicycle–transit integration has been minimal on the personal safety of bicyclists, operators, and the public, and on transit agency property. Bike racks on the fronts of buses have not proven to interfere with driving. Because of concerns about bicycles aboard crowded trains during rush hours, some commuter rail programs have limited bike–on–train access to off–peak hours. Most U.S. bike–on–bus services do not require a permit. While some U.S. transit systems accommodate bikes only on designated routes, others, such as Phoenix, AZ, Aspen, CO, and Sacramento, CA, have no route restrictions and have opened their entire system to carrying bicycles (see figure 18–2). Figure 18–2. Photo. Some transit agencies allow bicyclists to carry their bikes onto buses. From the response received, it would not be a stretch to say that the program was overwhelmingly popular among transit riders and [was] hailed as an excellent idea by bike riders. For bus patrons it is an added option, for bike riders it is an opportunity, and for public transit it is another step toward reducing the number of vehicles traveling on the road. 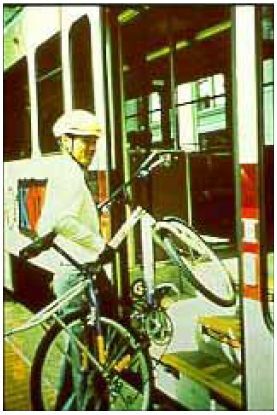 As a result of the successful demonstration, the Phoenix Transit bike–on–bus program was expanded systemwide in July 1992. 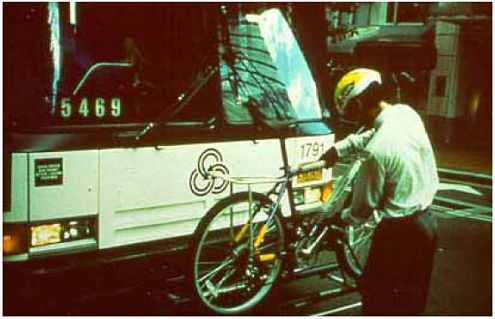 By 1997, all 463 buses in the Phoenix system were equipped with front–mounted bike racks, each of which carried two bikes. A survey in 1997 found that there were 2,146 daily users of the bike racks within Phoenix alone (not including use outside of Phoenix). The success of the Phoenix program quickly caught the attention of other transit agencies and it is now estimated that more than one in five transit buses in the country are equipped with bike racks. In 1993, the Seattle/King County, State of Washington transit agency, Metro, used more than $900,000 of Congestion Mitigation and Air Quality (CMAQ) funds to equip every one of its 1,200 buses with racks. The agency now boasts more than 40,000 bicycle–carrying passengers every month. The racks were designed and supplied by a northwestern U.S. firm whose racks now carry more than 250,000 riders each month on systems throughout the country. The Tompkins Consolidated Area Transit (TCAT) agency in Ithaca, NY, used STP funds to install racks on its 42 buses in August 1996. After one year, it was carrying 1,000 bicyclists a month. The agency estimates that, within the city, 1.2 bicycles are carried for every 100 passengers. Although most transit agencies offering bike–on–bus services have relied on various devices outside the bus, a few agencies have decided that such hardware is unnecessary and have allowed bicycles inside their buses instead. Westchester County Department of Transportation (WCDOT), located near New York, NY, simply adopted a permissive "welcome aboard" policy toward bicyclists and other potential users, beginning in the late 1970s. The space provided for passengers who use wheelchairs could be used by those traveling with baby carriages, shopping carts, bulky packages, or bicycles. This policy applied only to accessible Advanced Design Buses (ADBs) and only in off–peak periods. Wheelchair users were given priority over bicycles at all times. No problems had been reported with the service. Most light and heavy rail systems now provide some level of access to bicyclists and their bicycles (see figure 18–3). In systems with dedicated bike racks inside the rail cars (e.g., Caltrain® and SCVTA in California), the only restrictions relate to capacity and points of access to the train. In systems without dedicated space (e.g., Portland, OR, Washington, DC, and Boston, MA), riders may take bicycles on board except during the morning and evening peak hours and on festival and other major event days. Figure 18–3. Photos. 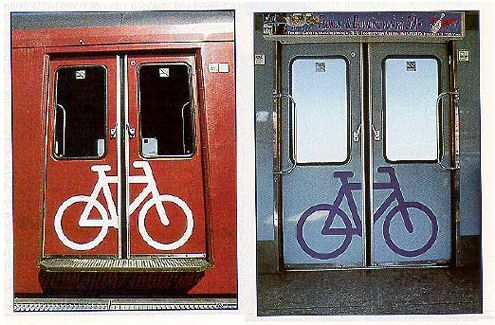 Bicycle stencils on doors of Danish State railways indicate those cars where bikes may be brought on the train. The Tri–County Metropolitan Transportation District of Oregon (Tri–Met) light rail system (known as MAX) in Portland, OR, is one of the few systems still requiring riders to obtain a permit before bringing bikes on board. The permit costs $5 and requires the rider to watch an 8–minute safety and operation video. Like a number of other transit agencies, the Washington [DC] Metropolitan Area Transit Authority (WMATA) eliminated its permit requirement for bringing bicycles on Metro trains. This simplifies travel for bike–transit users and encourages more bike–transit trips (http://www.wmata.com). In the United States, nearly all bike–on–rail services are restricted to times outside weekday peak hours. The exceptions are the Bay Area Rapid Transit (BART) in San Francisco, CA, and the commuter rail system in Boston, MA, which allows bicycles to be carried during peak hours in the "reverse commute" direction only. Restrictions on most systems prohibit bicycles on rail weekdays before 9 or 9:30 a.m. (some allow bikes before 6 a.m.) and from 3 or 3:30 p.m. to 6:30 p.m. Weekend policies vary, with some systems having no restrictions and some blocking out certain hours when there is substantial shopping, work, or recreational travel. Several European bike–on–rail systems, including Oslo and Amsterdam, have no restrictions on the times when bicycles can be brought on board. Without any restrictions, bicyclists, using their own common sense, tend to avoid bringing bicycles into rail cars during crowded rush hours. SCVTA leads the United States in adopting the most European attitude toward bike–on–rail, allowing two bicycles per car in peak hours, and four per car in off–peak hours. Restrictions on the number of bikes permitted on each rail transit system vary. Some systems permit two bicycles per car; others allow bicycles only on the last car of the train, with a maximum of four bicycles per train. Rail transit system restrictions on the number of bicycles permitted are based in part on rail car designs available in the United States, for which bicycle accommodation has not been a consideration. On the Metropolitan Atlanta Rapid Transit Authority (MARTA) system in Atlanta, GA, and on other systems, bicyclists hold their bikes in a foldup seat area near the back door of the rail car. In California, design of the new California Car rail car, mandated and funded by Proposition 116, requires accommodation of a reasonable number of bicycles carried on board by passengers for both intercity and commuter applications. The California Car is a bilevel car that superficially resembles Amtrak’s® Superliner®, but with significant design differences, including bicycle storage on the lower level of the car. This new rail car, for use on State–sponsored Amtrak and local commuter rail services, is a promising new development in the United States. Its specifications could be adapted by other rail agencies to enhance bicycle–rail linkage. The City of Charlotte, NC, began a project in 1981 to encourage walking and bicycle access to bus transit along its heavily traveled Central Avenue Corridor, which contains seven intersections at a LOS of E or F during the peak hours. To help address bicycle access needs, bicycle racks and lockers were installed at key bus stops. Pedestrian access was improved by installing 114 pedestrian signals and 115 pushbuttons at key intersections, and sidewalks were constructed with curb–cut ramps. Availability of bicycle racks and lockers. Condition and availability of sidewalks, crossings, and bicycle access surrounding stations. Traffic conditions such as traffic volumes and speed. Lane widths, surface conditions, parking, and bridges. Traffic mix and related considerations. Cities and transit authorities across the country are beginning to recognize the crucial role of secure bicycle parking at transit stations in promoting increased bicycle access to transit (see figure 18–4). A number of the Nation’s commuter rail and rail transit systems are investing in bicycle parking, but many lack a more comprehensive strategy that looks at the environment beyond the station. Frequently, the quality of the parking provided is inadequate, leaving most bicycles vulnerable to theft and vandalism. The majority of suburban bus transit systems, which could expand service area and ridership through bicycle–transit interface, appear to pay little, if any, attention to bicycle parking facilities at bus stops. Figure 18–4. Photo. Lack of adequate bike parking is a common problem at urban subways. There is wide variation in the use of bicycle racks and lockers at rail stations and transit systems. Two crucial factors appear to be the degree to which the environment leading to the station is bicycle–friendly and the quality of the bicycle parking provided. In areas where separate bicycle paths or bike lanes on streets have been implemented, facilitating connection to rail or bus services, the ease and safety of access by bicycle is greatly enhanced. Access to many stations, however, passes through streets where little or no thought has been given to bicycle safety, which curtails the extent of this access. The degree to which a transit agency actively promotes its bicycle parking facilities, and more broadly, promotes the environmental and social benefits of bicycle access versus auto access, directly impacts the use of bicycle lockers and racks. Bikestations provide another innovative method of integrating bicycles with transit and supporting bicycle transportation in general. 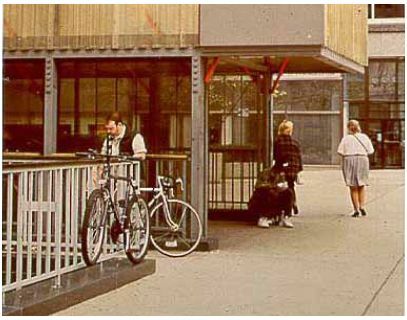 The Bikestation concept originated in Europe and Japan and essentially is a holistic approach to providing everything the bicyclist needs in one location. A typical Bikestation can include secure indoor bike parking, a repair shop, bike sales and rentals, car sharing services, changing rooms, route and transit information, and a variety of other support services. The first Bikestation in the U.S. opened in Long Beach, CA. A number of other cities throughout the country have either already built Bikestations or are in the process of planning new Bikestations, including Seattle, WA, Palo Alto, CA, and Washington, DC. Individual Bikestations are typically developed by franchises (either nonprofit or for profit) and are membership–based. Many successful programs began with a limited demonstration phase and then expanded to a broader, or even systemwide, operation. Demonstration projects tend to focus on identifying and solving specific technical and operational aspects of the service and usually lead to wider program implementation. Such a committee should include nonagency organizations and individuals who have experience in bicycle advocacy in their community, an interest in bicycle–transit programs, knowledge of user needs and constituency characteristics, and some expertise in bicycle and/or transit issues. A bike–transit program must vigorously market and promote in order to be effective: a brochure describing the agency’s program, a telephone number for information, and drawings or photographs of equipment to help users understand operating procedures. Tri–Met in Portland, OR, distributed 4,000 brochures directly to the local bicycle advocacy group’s membership. In Philadelphia, PA, the Southeastern Pennsylvania Transportation Authority (SEPTA) prepared a pamphlet highlighting eight scenic and cultural destinations for bicycle touring that were accessible by its local rail systems. Bike–to–Work Days and bicycle fairs or offers of free test rides have also proven effective in promoting new programs. Choose a local transit station (or individual transit stop) and determine the potential catchment area. Design a program for increasing bicycle and pedestrian access to the transit station, including both design improvements and education/promotion efforts. For physical improvements, include both the immediate vicinity and the connections to origins that lie in the catchment area. Choose a nearby transit stop or park–and–ride station and ride a bike or walk to it. Document the problems along the way, as well as those you experience when you arrive at the station/stop. Given your knowledge of the community, what would it take to get people to bicycle and walk to this site? "Case Study No. 17: Bicycle and Pedestrian Policies and Programs in Asia, Australia, and New Zealand," National Bicycling and Walking Study, Publication No. FHWA–PD–93–016, FHWA, Washington, DC, 1993. "Case Study No. 9: Linking Bicycle/Pedestrian Facilities With Transit," National Bicycling and Walking Study, Publication No. FHWA–PD–93–012, FHWA, Washington, DC, 1992. Integration of Bicycles and Transit, TCRP Synthesis 4, TCRP, TRB, National Research Council, Washington, DC, 1994, available online at http://gulliver.trb.org/publications/tcrp/tsyn04.pdf. Bicycles and Transit: A Partnership that Works, FTA and FHWA, Washington, DC, 1999.